"Aurélien Laherte is part of a dynamic, young generation of vignerons making waves in Champagne and producing a fine array of terroir-driven Champagnes using a natural approach to viticulture and winemaking. Along with his high school friend Raphael Bereche – another rising star in the region - Aurélien founded the "Terres et Vins" group of Champenois producers in 2009. This group taps some of Champagne's more progressive and like-minded producers, including Agrapart and Marie-Courtin, among others. Each spring, the group holds a tasting in Champagne to showcase both the vins clairs of the previous harvest as well as their actual bubbly versions. The notion of holding a tasting of Champagne vins clairs would have been unheard of 10 or 15 years ago, as these raw, screechy-acid wines can often be a teeth-chattering experience. But the progress in viticulture and winemaking has resulted in a new school of "Vinous Champagnes" as well as a sea change in how the beverage itself is perceived. Alas, Champagne is, first and foremost, a wine! The Laherte family has a long history in the region. Founded in 1889 by Jean-Baptiste Laherte, the estate was originally made up of vines primarily in the village of Chavot. Fourth generation vigneron Michel Laherte expanded the family estate which then covered about five hectares. With his wife Cécile, the two young vignerons modernized the press and tanks, but soon realized that too much modernity such as the use of herbicides and pesticides would prevent full terroir expression in the wines. They began working the soils, gently vinifying the juices, and remaining humble and patient as the wines developed. This philosophy is the foundation of the estate and has endured through the generations. Today, under the direction of Aurélien Laherte who took over in 2005, the estate has become one of the most progressive and dynamic "rising stars" in the appellation. Like many of Champagne's top practicioners, the estate has begun to produce a series of tiny production, single-vineyard/single vintage cuvees (around 3000 bottles ea) from some of their most unique and expressive Biodynamically-farmed parcels. These wines are all vinified in used Burgundy barrels, without malolactic fermentations, and are bottled without fining and filtration. They are then finished with little or no dosage so as to not mask the individuality of the underlying terroirs. But the mainstay of the Laherte range are the Brut, Extra Brut and Rose, which are called Ultradition (see descriptions below). Aurelien has also initiated a cuvee of super racy and mineral-driven Blanc de Blanc done in Brut Nature from chalky soils in and around Chavot. The Larherte vineyards are situated largely in the Coteaux Sud D'Epernay, an interesting sub-region sandwiched between the Cotes des Blancs and the Vallee de la Marne, with pockets of soils that greatly resemble these two fine and geologically diverse regions. The vineyards themselves total 10.5 hectares (over 75 separate parcels), seven of which are farmed biodynamically and certified organic, with the rest farmed either 'uncertified organic' or at least sustainably. Great lengths are taken to ensure each vine fully expresses itself and the underlying terroir. A team of ten, including aunts, uncles, and cousins, works throughout the year (in accordance with the lunar calendar) to employ techniques such as plant infusions to improve the vine's natural defense system, and high foliage to encourage photosynthesis and thus, balanced maturity. Given the diversity of soils and expositions, the three major grape varieties of Pinot Noir, Meunier and Chardonnay all thrive and are planted on the southern slopes of Epernay in the villages of Chavot, Epernay, Vaudencourt, Moussy and Morangis. The family also has some 1er Cru Chardonnay vineyards on the famed Côte de Blancs in the villages of Vertus and Voipreux. And finally, more Meunier plantings are found in the villages of Le Breuil and Bourgault in the Vallée de la Marne, often referred to as Meunier country. Ultradition Brut NV - Blend of 60% Meunier, 30% Chardonnay and 10% Pinot Noir, 40% of which are reserve wines, from selected parcels in seven villages in the Côteaux sud d'Epernay, Côte des Blancs and Vallée de la Marne. Primary fermentation takes places in a combination of foudres (20%) tank (20%) and barrel (60%) with regular lees stirring. The wine goes through partial malolactic fermentation and is dosed at 6-8 gr/l. It is a fine and complex blend that is perfect as an aperitif. Ultradition Extra Brut NV – Similar blend as the Ultradition Brut, but held one year longer en-tirage before disgorgement, and is dosed at 4.5 gr/l. The label is a replica of an original label used by the family in the early days of estate bottling. It is a bit racier and taughter than the regular Brut, and would make a fine aperitif as well, or even paired with oysters or shellfish. Ultradition Rosé NV - Blend of 50% Meunier, 30% Pinot Noir and 10% Chardonnay, 40% of which are reserve wines. Up to 15% of still red wine from Meunier is added. Primary fermentation takes place in foudres and the wine goes through partial malolactic fermentation. Only the best grapes from old vine Pinot Noir and Meunier are selected for this bottling. Dosage is 7 gr/l. Blanc De Blancs Brut Nature NV - Best parcels of Chardonnay from the southern slopes of Epernay and the Côte des Blancs. 50% of reserve wine is included in this blend. Primary fermentation takes places in a combination of foudres and barrels with regular lees stirring. The wine goes through partial malolactic fermentation and has zero dosage. This Blanc de Blancs is representative of the purity and bracing minerality of Chardonnay found in the chalky soils of the area. Les 7 - A single parcel planted on the slopes of Chavot in 2003 by Aurelien's father Thierry Laherte as a nod to ancient traditions. Worked with a horse. Blend of the seven indigenous grape varieties of the region including 18% Chardonnay, 18% Meunier, 17% Pinot blanc, 15% Petit Meslier, 14% Pinot Noir, 10% Fromonteau (Pinot gris), and 8% Arbane. Six months of aging with regular lees stirring, no malo, blend of 60% of current vintage and 40% of a solera combining each vintage since the start in 2005. Dosage is 4 gr/l. Les Vignes d'Autrefois - Selected old vine, massale selection parcels of Meunier planted between 1947 and 1953 in the villages of Chavot and Mancy. Soils are clay and silt with flint, small stones and chalky subsoils. Primary fermentation takes place in neutral barrels from Burgundy, aged 6 months with regular lees stirring, no malo, dosage of 2-4 gr/l. Intended as a tribute to their ancestors and to the Meunier grape. Les Empreintes - Blend of 50% Chardonnay (1/3 Chardonnay Muscaté) from Chavot parcel of Les Chemins d'Epernay planted in 1957, and 50% Pinot Noir from Chavot parcel of Les Rouge Maisons planted in 1983. Primary fermentation in neutral barrels from Burgundy, aged 6 months with regular lees stirring, no malo, minimum of 3 years aging in bottle, dosage of 4 gr/l. Les Empreintes is the quintessential expression of Chavot terroir with its flinty clay topsoils and chalky subsoils. Rosé de Saignée Les Baudiers - Old vines (planted in 1953, 1958 and 1965) in the low-yielding parcel of Les Baudiers planted to Meunier, but the occasional Chardonnay, Pinot Noir and Fromonteau vines are found in the vineyard as well. Extremely careful, meticulous work is done in the vineyard to obtain the healthiest grapes. Destemming and maceration of 12-16 hours, primary fermentation in barrel, no malo, aged minimum of 4 years, dosed at 0-5 gr/l depending on the vintage. Aurelien seeks a vinous and textured wine but with delicacy and lift for a rosé de saignée. 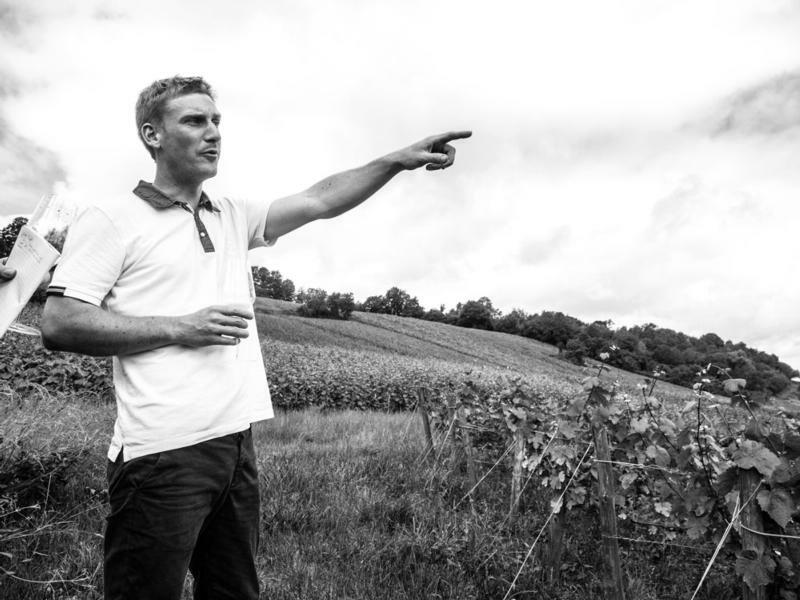 The more we see growers like Aurélien Laherte who endlessly strive to respect and express the identity of their land, the more we are convinced that Champagne is a beacon for natural viniculture and winemaking, and shines as one of most dramatically evolving wine regions in France. We are honored and happy to be along for the ride."